A sobering look at the intimate relationship between political power and the news media, When the Press Fails argues the dependence of reporters on official sources disastrously thwarts coverage of dissenting voices from outside the Beltway. The result is both an indictment of official spin and an urgent call to action that questions why the mainstream press failed to challenge the Bush administration’s arguments for an invasion of Iraq or to illuminate administration policies underlying the Abu Ghraib controversy. Drawing on revealing interviews with Washington insiders and analysis of content from major news outlets, the authors illustrate the media’s unilateral surrender to White House spin whenever oppositional voices elsewhere in government fall silent. Contrasting these grave failures with the refreshingly critical reporting on Hurricane Katrina—a rare event that caught officials off guard, enabling journalists to enter a no-spin zone—When the Press Fails concludes by proposing new practices to reduce reporters’ dependence on power. "The hand-in-glove relationship of the U.S. media with the White House is mercilessly exposed in this determined and disheartening study that repeatedly reveals how the press has toed the official line at those moments when its independence was most needed." "Bennett, Lawrence, and Livingston are indisputably right about the news media’s dereliction in covering the administration’s campaign to take the nation to war against Iraq." "Their analysis of the weaknesses of Washington journalism deserves close attention." "This is a vigorously researched book, showing how crises, such as the Abu Ghraib prison scandal, flare up and are swiftly extinguished: ’torture’ is diluted to ’abuse,’ to ’mistreatment’; culpability is segregated to a few bad apples." "The boldest thesis in this book, the one I was most delighted to see—and least able to assert is really true—is that this attitude of timidity and obeisance [by the media] is actually bringing on the decline in readership and viewership that it, in part, seeks to avoid." 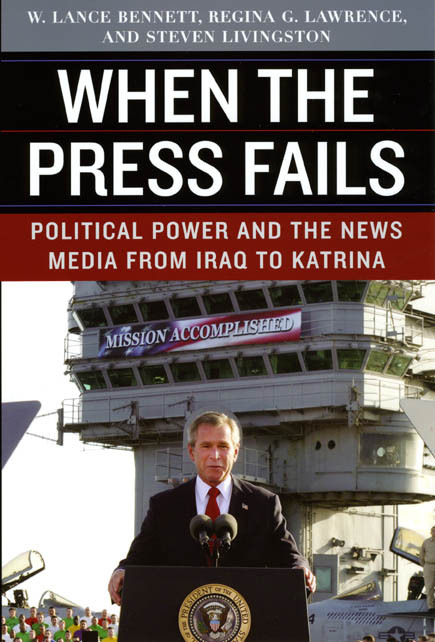 "The breadth is so thorough and the prose so engaging that this book has the potential to become the definitive account of media politics during the Bush years. . . . When the Press Fails is an excellent book. Its positive arguments are a model of good social science research. I suspect that they would also work well in an undergraduate class, as a first exposure to serious media research. Furthermore, the book’s normative assertions are well argued, provocative, and a good place to start a class discussion about the proper role of the media in a democracy. In summary, if you want an introduction to how the media operates in the modern American political system, this is a good place to start." "An important book which will become a ’must’ read in future analyses that focus on press-government relations. It is well written, in a way that would make it completely comprehensible to nonscholars who care more about press freedom, government spins, and the coverage of the Iraqi war than about political communication theories."